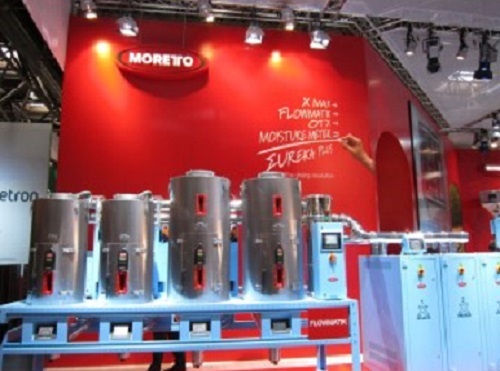 Italy-based Moretto S.p.A. presented at K 2013 a preview of its ONE WIRE 6 (OW6), the self adaptive control and management system for materials conveying. As introduced, it is not necessary to set time and parameters on the new OW6. The control system for centralized conveying systems is now completely automatic. A machine that collects the material to be processed at 20m distance can be connected to the stored material at 100m distance simply connecting the machine to the desired pipe, and no data or parameters need to be modified. OW6 will be able to recognize the new conditions and will self adapt. There is no risk of material block or time to be set as ONE WIRE doesn’t request cycle or cleaning pipe setting operations, thus ensuring maximum efficiency. The attention will be focused just on the quality of the process without the need to care about setting parameters. OW6 has a 10″ touch screen interface with objects programming making it easy for the production control. It is equipped also with Master 600 palm top in order to create customized profiles. The OW6 server is able to manage up to 80 clients among receivers, suction units and automatic manifolds. The modular system and easy installation keeps extension simple at any time. Wall-mounted, frame-mounted, floor-mounted installations are possible. In presence of mezzanines the control can be placed on the level floor, adding to the master touch a second touch that can be placed according to the user’s needs in order to make access to control easier. OW6 is prearranged to accept KRUISE KONTROL. To enrich the Moretto proposal for feeding and conveying process there will be also the renewed receivers range with new KASKO models. The KASKO models have a new design, more compact dimensions, double efficiency and they can be easily installed. New cyclone filter with high efficiency will complete the offer in feeding and conveying. These filters don’t require any maintenance. This new generation of filters has no equal, they are noiseless, filtration capacity is two micron and the filter capacity has been increased.